This week I will still be working on my Dear Jane Quilt. Only 4 more rows to go!! Will post photos later this week. Also on the Design Wall is my March UFO: Jeweled Forest. 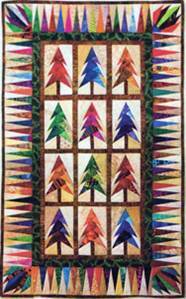 This is a pattern from the December 2009 issue of McCalls Quilting, and is entirely paper pieced. I really enjoy paper piecing, so looking forward to working on this one. Have a great week and hope you get lots of sewing time in! To see other design walls go to Pa﻿tchwork Times. Oh wow, paper pieced, you have a job ahead of you. I sure like the pattern, but I think I will stick to piecing blocks. Wow!! Love love love this! I really like the design of your trees, and the colours you have used. I like the finish paper piecing gives to. The points are always so crisp, clean and lovely. What a coincidence! I was JUST looking through a bunch of old quilting magazines looking for a pattern I wanted to make (paper pieced watches) and saw this very quilt and marked the page for a future project! Beautiful job! That is a fabulous quilt. The colors are so rich. Nice! So cute.. I am not a fan of paper piecing myself but it does look great. Perfect points.